On Tuesday, September 11, 2001, only a few members of the then-People’s Weekly World staff were in the lower Manhattan editorial office when the airplanes hit the Twin Towers at 8:46 a.m. and 9:03 a.m. They worked under extraordinary conditions to meet the Wednesday deadline and produce a newspaper that week. It was a four-page edition that contained a statement from the Communist Party USA condemning the terrorist attacks, and praising the first-responders and their heroism. In the following People’s Weekly World editions, reporters worked to gather responses to the crisis by the people who rushed to help at New York City’s Ground Zero, as well as at the Pentagon and Shanksville, Pa. Many of the people interviewed urged a firm response to the culprits behind the terrorist attacks, but not for the “war on terror” advocated by the Bush administration. PeoplesWorld.org republishes these stories here as part of commemorating the anniversary of that tragic day. NEW YORK CITY – In moments of natural disaster people come together to respond. Yet the destruction of the World Trade Center (WTC) is not a natural disaster, like a tornado or earthquake. It is a political disaster, an international disaster, a human tragedy that moves people to respond. Many are worried about where humanity will go from here. “I live in Brooklyn Heights and saw the whole thing. It was horrible,” said Dina, a volunteer at the Armory at 26th Street and Lexington Ave., where the families of the missing are gathering. Around the city, flags are flying from windows, in storefronts, on cabs and trucks. U.S. flags are flying side by side with Puerto Rican, Mexican and Irish flags. On street corners and doorsteps in neighborhoods around Manhattan burning candles stand as small monuments to hope and peace. Tens of thousands have participated in candlelight vigils. It’s a city coming to terms with one of the most horrific events in U.S. history. The crowds that gather at “command central” at the Jacob Javits Center are Latino, Black and white, Arab, Asian and American Indian, immigrants and citizens. Many are skilled workers wearing T-shirts of the Electrical workers, Ironworkers or Laborers unions. They have the skills to excavate the ruins of the WTC. Firefighters, police emergency technicians, doctors and nurses are also there. Many are young, looking for a way to share the burden of this atrocity by doing the small tasks of handling donated supplies and cooking food. All volunteers are wearing pieces of tape as makeshift name tags. There is a sense of community here. Bucket brigades of 20-30 people move shovels, socks, bottled water and paper towels into piles. Bags of dog food are a reminder of the continuing hope that search dogs will find survivors under the rubble. Workers in hardhats stand in the middle of the West Side Highway directing the traffic of trucks and heavy equipment. Food and drink are being served up and down the sidewalks to the thousands of volunteers. “This is the most horrendous thing I’ve seen in my life, just unnecessary carnage and pain,” said Barry, a laborer from Manhattan. “We’ve got to stop passing the pain around. We’ve got a history full of this. All throughout time,” he said. “Yesterday, [seeing] the fire trucks come by here with the firemen in them, people were applauding and screaming and waving the flags … My skin just got goose bumps,” Jimmy, a laborer from Elizabeth, N.J., said. The sense of urgency and frustration about whether they get to use their skills to help could be seen on their faces as they anxiously wait for their name to be called for assignments at Ground Zero. Many have set aside their own lives and made tremendous sacrifices to fight for the chance to save lives. Urban search and rescue teams have come from 15 countries. Teams have also come from places like Pine Ridge Indian Reservation. One of them was Wendell, who had organized an American Indian team made up of police officers, EMTs and firefighters. “We had a big disaster down in our town a couple of years ago. A lot of people came to help out from different areas, so we decided to give something back … People are willing to help out any way they can with this,” Wendell said. People of all races and nationalities were in the WTC when the planes hit. Some 700 Arabs are believed to be among the missing, according to some reports. “My biggest fear … is all the ethnic attacks on the Muslim community and also the southeast Asian community … it’s a tragedy what’s happened in the World Trade Center, but this could escalate [into] other incidents of human rights violations,” said one volunteer from New York City. The most important message for the American government to give its people “is that we need to stand strong and unite,” another worker said. The world and our country will never be the same. As each day passes, new thinking about the whys and hows will emerge. The volunteers’ dramatic response will be recorded, especially as a part of a massive upsurge of social action, which is the essence of democracy and empowerment. 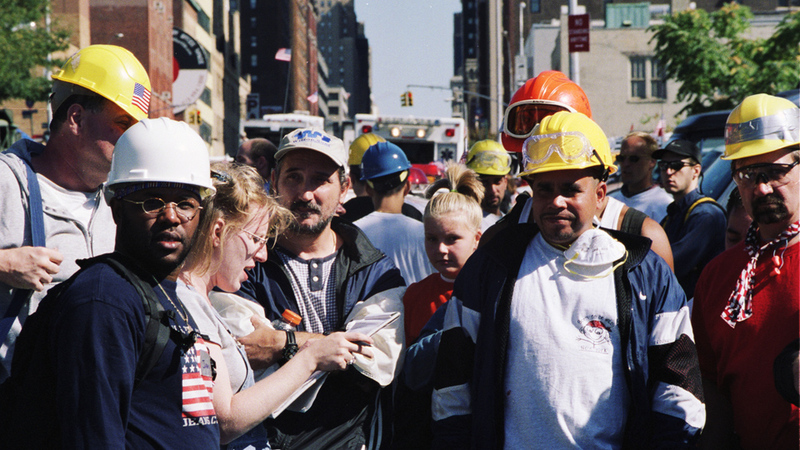 A week after the attack, many of the skilled volunteer workers were being utilized as support personnel as larger heavy equipment construction companies with union employees are brought into the search and rescue area. The disaster is far from over, with more than 5,000 still missing and presumed dead, but life in Manhattan is struggling towards normalcy. The volunteers shared their wisdom with the World this week. Their basic truisms: Unity and solidarity can make us stronger. Mourning is not a cry for vengeance. Together we have to find a way out of the crisis. The Ground Zero solidarity can be turned toward the problems we will face in the days to come. “The president said we’re at war now. We don’t want to become the people that we’re dealing with now,” said Nancy, who was holding a sign of appreciation for the Ground Zero crew. This story was first digitally published September 8, 2011; it was updated and redated on September 11, 2013, 2016 and 2017. 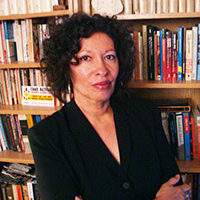 Judith Le Blanc is a member of the Caddo Tribe of Oklahoma. From 2005-2008 she was the National Co-chair of United for Peace and Justice (UFPJ) an organization that she helped found. She is nationally recognized as a leader of the U.S. peace and justice movement and has traveled around the world, including to Beirut during the 2007 invasion by Israel. Le Blanc was formerly a reporter for the People's Weekly World, forerunner of the People's World. She has written extensively on her travels to Japan, Palestine, Israel, Lebanon and elsewhere and was an eyewitness reporter on the 9-11 attacks and their aftermath in New York City.